Watching the animation, in the top window you’ll see what looks like simulation log messages floating by. They look like log messages because they are log messages from a real sim running in the background. The ‘$cmd>’ messages are also real in that they’re piped to and drive the animation. Whether or not our friend on the sailboat floats away into the sunshine or gets pounded by rain depends on the output of the uvm_boat_anchor. This is what that code looks like. It’s pretty simple. What I don’t show you is what’s happening inside the ba.weigh_anchor() routine (though I did hint at it earlier this week). The weigh_anchor() routine depends on properly functioning defects in the UVM that we found in UVM-UTest; properly functioning in that the code we verified as being wrong produces precisely the wrong result we expect. As long as nine out of the ten issues we filed remain open (the 10th isn’t really a functional issue), the weigh_anchor() routine returns true, the uvm_boat_anchor flips back into the boat and it sails away. If any of those defects are fixed… say in a uvm-1.1e release… the boat anchor breaks and the poor sailboat is caught in the rainstorm. …unless, that is, you’ve protected yourself from unforeseen changes the way we’re doing with UVM-UTest. We’ve started locking down functionality of the library with unit tests so if anything breaks, we know immediately. 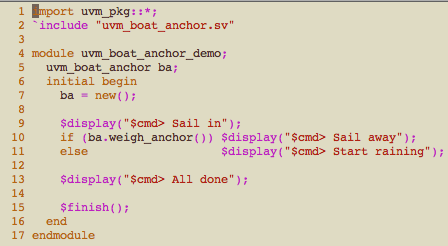 No coincidence, I built the same kind of protection into the uvm_boat_anchor (using TDD). If any of the nine UVM defects I rely on are fixed in a 1.1e release, the corresponding unit test will break thereby telling me exactly what’s happened. From there it’s a quick fix. That’s the value of unit tests and the suggested value of our DVCon proposal. Without unit tests, if your code changes in ways you don’t expect at times you’re not expecting, whether it’s RTL, testbench IP, the UVM or a silly uvm_boat_anchor, you’re going to end up stuck. How long you’re stuck for depends on the weight of the anchor and the depth of the water, neither of which you’ll have much control over ;). This entry was posted in Functional Verification and tagged DVCon, UVM. Bookmark the permalink.